Metal racking shelves covers a large range of storage products from long span shelving through to pallet and warehouse racking. The term metal racking shelves can be used to describe even light weight open metal shelving systems of the type used in stores departments and for rack or shelving supported mezzanine floor systems. Most people who enquire with us about metal rack shelving are looking for a heavy duty metal storage system to store large and bulky products. Metal racking shelving can be adjusted to suite a wide range of objects with larger heavier objects usually being stored on the bottom or ground levels. With metal racking shelving covering such a wide range of products it is always best to ask us to discuss your shelving requirements to make sure you get the best value product for your needs. Our metal rack shelves come in a wide range on sizes for height width and depth allowing you to chose what best fits your storage needs. We also offer a free site survey for commercial projects with our excellent in house design team to help you get the optimum design to fit your storage requirements and building layout. We have shelves and pallet racking to take light weight items through to 30 tonnes and being the largest supplier in the North of England for the UK top manufacture of shelving and pallet racking allows us to buy at heavily discounted prices and pass on those saving to you. So for a simple and cost effective solution for your shelving, racking or mezzanine floor needs call our design team here at our HQ in Yorkshire on 01937 585057 for a fast and friendly service. 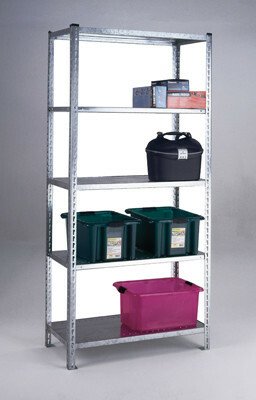 Click here to see our full shelving range.